Timely availability of improved seeds at affordable prices is critical to increased productivity by smallholder farmers in Africa. 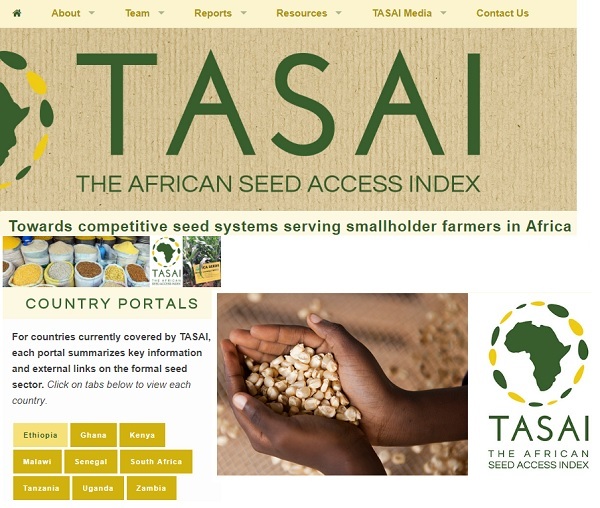 The African Seed Access Index (TASAI) is a tool that appraises the structure and economic performance of formal seed sectors, thus defining success for seed systems based on its ability to deliver the following outcomes for farmers: Availability, Accessibility, Affordability, and Quality. Improved seeds can deliver state of the art technology to farmers including higher yields, disease and pest resistance, climate change adaptation, and improved nutrition. To monitore the development and competitiveness of national seed sectors in Africa, in 2016 and 2017, TASAI research was conducted in 13 countries - Democratic Republic of Congo, Ethiopia, Ghana, Kenya, Madagascar, Malawi, Mozambique, Senegal, South Africa, Tanzania, Uganda, Zambia, and Zimbabwe [Read: Policy briefs summarizing each country research study]. The central objective of TASAI is to encourage African governments and development agencies to create and maintain enabling environments that will accelerate the development of local private sector-led seed systems serving smallholder farmers. The intended outcome of TASAI is improved access to locally adapted, affordable, and high-quality seed of appropriate varieties by smallholder farmers in Sub-Saharan Africa. Data on all the 20 indicators across the 13 countries, are presented in the TASAI Data Appendix. TASAI is going to be widely used by practitioners in the public sector, private sector, and development aid agencies to both inform and compel change. For more information on TASAI, please contact Dr. Ed Mabaya (em37@cornell.edu) or Mainza Mugoya (mmugoya@marketmattersinc.org).